In 2016, more than 12,000 facelifts were performed on men in the U.S. 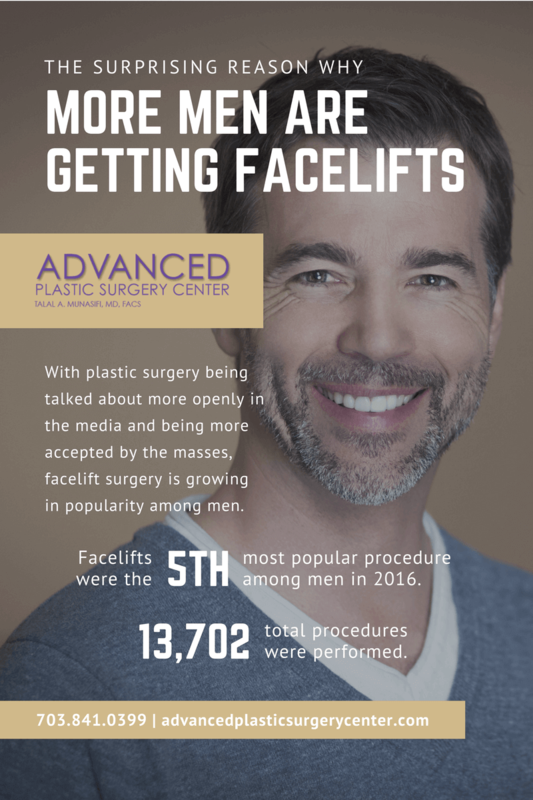 Although men only accounted for 9% of all facelifts performed, the number of men seeking plastic surgery is growing. Why are men choosing facelift surgery? The answer may surprise you. Come into one of our Virginia offices for a consultation with Dr. Munasifi to discover your options for facial rejuvenation. In today’s competitive job market, a little advantage can make a big difference. Nearly 9 million Americans over 65 are employed, more than at any other time this century. Finding a job, or landing that promotion, can be a real challenge for older men and women. Age discrimination accounts for 1 in 5 discrimination complaints to the EOC. Many of our patients choose facelift surgery to keep their competitive edge in a tough job market. Youthful looks combined with years of wisdom can be a powerful combination, one that employers won’t want to overlook. Choose a Surgeon that Works with Male Patients Often- Male facelifts can be more difficult than female facelifts. The right surgeon is essential for good results. Men tend to bleed more than women during facial surgeries and are at a greater risk for developing a hematoma after surgery. Scaring can be more difficult for men to hide since they have shorter hair and don’t wear makeup. Facial hair is another challenge during a male facelift. The surgeon must carefully tighten the skin to minimize the appearance of facial hair in non-standard locations after surgery. An experienced male facelift surgeon knows how to mitigate these challenges for natural looking results. Set Realistic Expectations- What do you hope to achieve from your facelift? Work closely with your surgeon to ensure that your expectations for surgery align with the expected results. Don’t Wait Too Long- Facelifts are most effective when performed at the right time. Aging should be sufficiently pronounced, but still in the moderate stages. Come see us now to determine if you’re a good candidate for surgery. A facelift resets the clock on your appearance and you’ll always look younger than you would have without the procedure, even many years later. Is a Facelift the Right Solution? - If you have sagging facial skin, jowls, or wrinkles around the mouth and nose, you may be a good candidate for a facelift. Wrinkles around the eyes, brows, or forehead may require other procedures. We’ll help you decide if a facelift is the right option for you or if you could benefit more from other procedures. A facelift isn’t always the best procedure for every patient. Botox- Botox is so popular with male patients it is sometimes referred to as “Brotox”. This treatment can smooth out wrinkles around the eyes, on the forehead, and between the brows. With male patients, we often use a small amount of Botox to maintain a masculine, rugged look while reducing the appearance of wrinkles. Facials- Facials aren’t just for women. Get radiant, glowing skin, and fewer blemishes, with a facial. We personalize each facial we perform to target your skin concerns and improve your complexion. Facials require no downtime and are an enjoyable, relaxing experience. Laser Skin Rejuvenation- Sun damage is a common concern for our male patients. Laser skin rejuvenation can fade discoloration and improve skin tone and texture. We offer a variety of laser treatments for men including the Fraxel Laser, Laser Genesis, and Clear + Brilliant. Finally, don’t forget about the things you can do at home to care for your skin. Many of our male patients slack on sunscreen, moisturizing, and cleansing their skin. A little TLC at home can improve the appearance of your skin in between treatments at our offices. If wrinkles are covering up your youthful appearance, come see us and rejuvenate. Although many men choose a facelift to enhance their employment prospects, there are many other reasons to consider plastic surgery. Why do you want a facelift? Come and explore your options with Dr. Munasifi at Advanced Plastic Surgery Center.